There is a new theory about why animals like the woolly mammoths and saber-toothed cats disappeared and how the Clovis people of North America met their end about 12,900 years ago. Scientists say that they have found evidence that a comet blew up over the Great Lakes of North America during that time. Geologist James Kennett says the evidence comes in the form of a thin layer of sediment that is present throughout the area. This has been found to contain microscopic spheres of carbon and metals, bits of diamond, helium 3 and iridium, which is rare on earth but plentiful in extraterrestrial bodies like asteroids and comets. Kennett adds that the impact coincides with a period of cooling known as the Younger Dryas. At least 17 species are known to have become extinct around the time of the impact but more evidence is needed (like an impact crater) to prove that a cometary explosion was responsible. Strangely, there is a huge gap between the habitation period of the Clovis people in the Great Lakes and the later Native Americans of the region. 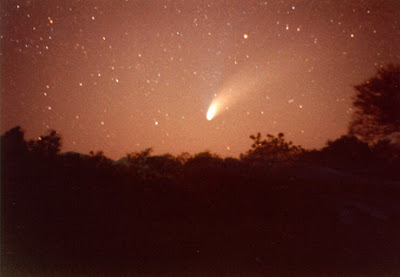 Pictured above is comet Hale-Bopp taken by Jose Fernando Barral Caballero over Mexico. 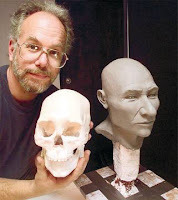 On the left is Tom McClelland and the reconstructed skull of Kennewick Man which he made with anthropologist Jim Chatters. Kennewick Man is thought to be one of the Clovis people that died out.